Welcome to my Super Zoom Camera reviews page. What are Super Zoom Cameras ? These are very well equipped compact cameras that are built to provide you with much greater zoom power than standard compact or even advanced cameras. They have been designed to get you closer to the action (e.g. sporting or wildlife events). Image stabilization and high quality lenses are crucial in order for these cameras to provide blur-free pictures. Super zoom cameras are usually slightly bigger than basic compact versions (well the zooms are more powerful for a start). However, quality and style still remains. Powerful lenses are an obvious feature with these cameras, with the long zoom reach at one end and wide-angle landscape-friendly views at the other. Image stabilization helps to keep pictures sharp – even at full zoom. Photography just got a lot easier thanks to the Canon A4000. Quality images and movies come effortlessly thanks to a feature called Smart Auto. The 8x optical zoom means that you’ll never be far from the action. The normal self-timer comes in 2 second, 10 second, or custom increments. If all the above is sounding confusing, then there is a Help Button which displays advice. It’s mainly a beginners tool, but it’s a nice add on. Overall the Canon Powershot A4000 is a very smart camera, that’s going to please photographers that like their cameras sleek and stylish. Easily small enough, it seems to glide into your pocket. Some might find it a bit too ‘slippery’ to hold though. A separate movie button on the rear of the camera is a nice touch and ensures that you can quickly revert into movie mode. Manual control is limited, but then that will suit most people who are the target market for this camera. In fact, this camera could quite easily sit in my Point and Shoot reviews section, were it not for the extended zoom, which therefore just pushes this model into this article. 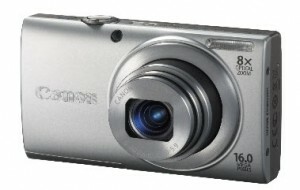 Unlike some other cameras reviewed recently, the optical zoom is fixed when videoing. The LCD screen is large and functions well. It can get a bit bleached out in direct sun light, by that is only to be expected with cameras of this type. The buttons and controls are set quite deep into the body of the camera. Some people (like me) prefer this, others would rather see the buttons protruding out more. Each to their own on that one. Overall, a nice camera that easily made my final review list. Menus are accessed from a standard menu button found at the centre of the four-way dial to the rear of the camera. 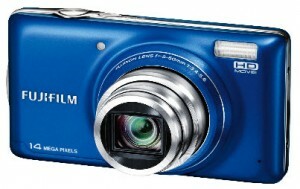 It may be small, but the large 3 inch LCD screen makes composition of your images easy. There is no messing about with settings for movies. A simple press of the button starts the HD recording, ensuring you don’t miss any of the action. Camera shake is all but eliminated with fujifilm’s CCD Shift Stabilization which does an excellent job at keeping the pictures sharp. One touch movie recording via a clearly marked button on the back panel, gets my nod of approval. The zoom is unblocked during movie recording and another plus is that the sound of the lens moving does not appear on the recording. As with many Fujifilm cameras, uploading your images and movies to social media platforms such as Facebook and YouTube is made easy with the software that’s included. The SZ-12 Modes are set on-screen in the quick menu , as opposed to a manual dial. The following modes are available : Program Auto, Intelligent Auto, Scene mode, and a Magic Filters mode. In the iAuto mode is a scene recognizing auto mode. This aims to identify the type of picture being taken (e.g. action, landscape, portrait, etc.) and adjusts the camera settings accordingly. There’s a choice of two menus for the operator. The quick menu enables you to access systems without scrolling and is very intuitive. On the other hand, the main menu, accessed via tabs, is more complex, but that is understandable considering the in-depth settings. The 24x optical zoom is truly exceptional in a camera at this price point. Amazing close-ups are a reality, but also the 25mm wide-angle enables you to get fantastic panoramas and group-shots. However, this camera has a lot more to it than just a powerful zoom. You can add in HD movie recording with stabilization, plus a plethora of Magic Filters for the creative minded. They include : Dramatic, Drawing, Fish Eye, Fragmented, Miniature, Pin Hole, Pop Art, Punk, Reflection, Soft Focus, Sparkle, and Watercolor. These features really catapults this camera to the next level. Self-timer is available at 2 seconds and 12 seconds – surprisingly no manual time-set. There’s also an unusual pet auto-shutter mode ? Yes it actually takes a photo from detecting the movement of your cat or dog ! Due to my lack of pets I haven’t been able to put this one to the test. Autofocus is very effective and images are lock-on very quickly. The camera also has spot AF, scene auto, face detection and AF tracking Modes. White balancing is available from the quick menu and there are 4 pre-sets : Daylight, Fluorescent, Overcast and Tungsten. Image stabilization is included and indeed necessary for such a long zoom capacity. Also, increased shutter speeds and ISO values are all designed to help the user obtain clean, blur-free, shots. The flash unit sits up out of the top of the unit via a mechanical release button on the front left hand side of the camera. There are settings available for background fill-in and red-eye reduction as well as the expected auto flash modes. This camera even has Wi-Fi compatibility. This means that you can share your photos on Facebook immediately. The lithium battery is charged up whilst still in the camera via a F-2AC adapter. As with many of the cameras being reviewed, this has an excellent in-camera help guide accessed via a button at the bottom of the panel. 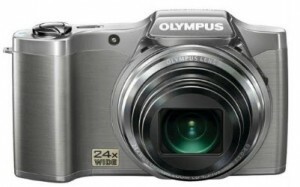 This is another camera that appears small but houses a very impressive 24x zoom lens range. You’ll not have to keep edging forward on your subject (ideal for wildlife photography then). A simple press of the zoom button and you are right on top of the action. Whilst the camera is chunky and therefore good to handle, there’s nothing to assist the grip (i.e. like the rubber sections or pimpled areas seen on other cameras). Having said that, all buttons and controls are all within easy reach – even when shooting one handed. For the creative, this camera has some of the most realistic effects I’ve seen on any camera. Drawing and Watercolor are particularly impressive and really will add a new artistic dimension to your images. Sparkle and reflection also became a little too addictive. The large LCD screen is clear and bright, possibly too bright for some. The lens barrel comes in several sections, but is very swift, responsive and accurate. It’s actually quite a pleasure to work to work with, compared with some of the ‘vague feeling’ you get with some compacts. It’s nice to see the connection ports covered on this camera – albeit with a rubber cover, which I’ve not always had success with (some I’ve had on cheaper cameras have distorted after a while). This camera is perfect for family and sporting events alike. Previous PostPrevious Camera Phones – The End of Traditional Photography ?